To attend the traditional tea ceremony, is there some etiquette? We start preparing for the New Year’s Day after Christmas. The first tea ceremony is the annual event in Japan. 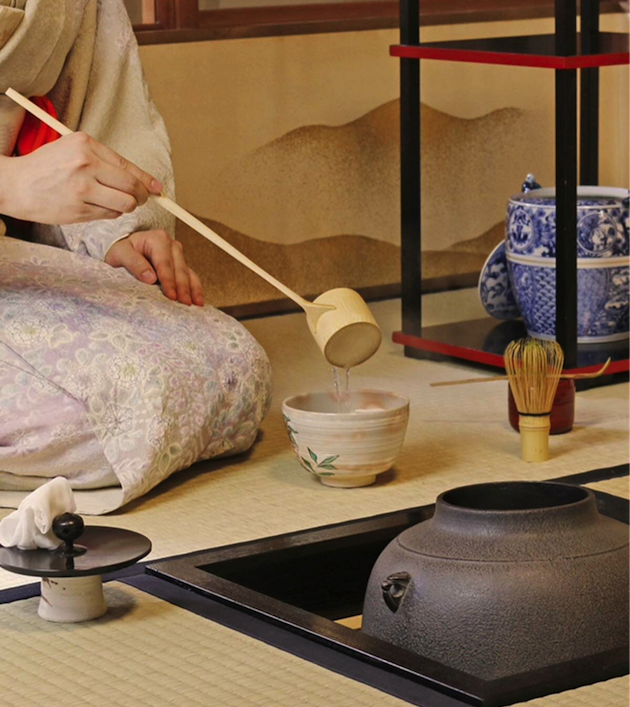 When we say tea ceremony, it sometimes means 3 to 4 hours “Chaji” including traditional meal with sake and thick tea, sometimes thick & light tea with light meal, or only light tea. Thinking about the whole ceremony of 3-4 hours, the main part is actually thick tea, but it is light tea which we have much more opportunity to drink. SO, I will introduce the way of drinking light tea today. Guests need nothing special to bring and we don’t have dress code in Tea Ceremony Koto, because here is the place especially for tourists and first experience people. But if you are invited to formal tea ceremony, usually we need to bring 3 things as a guest. A fan, papers for sweets and a small stick to cut and eat sweets. 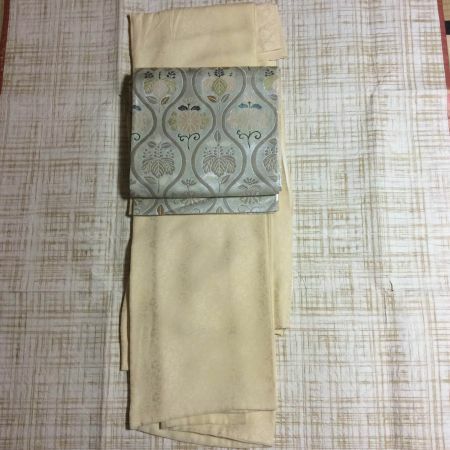 If you wear kimono, you need to see the material of the kimono. We usually avoid wearing kimono made of wool or weaved kimono called “tsumugi” for tea ceremony. I think plain color kimono one crest on the back side with a weaved sash(obi) is the most suitable for tea ceremony because it is thought that the main things are tea utensils such as tea bowls, a hanging scroll, flowers, not the clothes of us. If you have chosen the western clothes, it’s better not to wear too casual ones such as jeans& T shirt. In addition, long skirt is easier to sit on tatami mat than the short one and we usually bring white socks to change before entering a tea room. 1, Entering a tea room, first we sit in front of the alcove to see the hanging scroll and flowers. Maybe you will wonder why guests wearing kimono refrain from sitting on the first guest seat in a tea room. 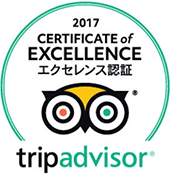 It is because the first guest should be the most knowledgeable person about tea ceremony. 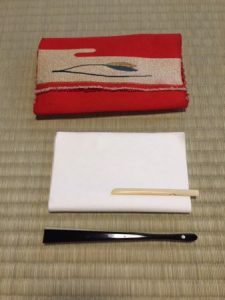 He or she need to ask the origin of the utensils in the best timing during the tea ceremony. So, experienced masters will be the first guest. 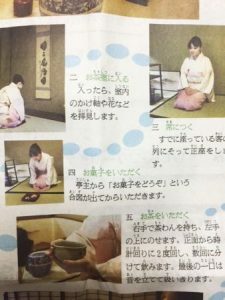 Since the last guest also has a roll to help a host sometimes, it is better to sit in the middle if it is first time for you to join tea ceremony. Before the way of tea starts, a host brings sweets in front of the first guest. We don’t eat soon, but wait till the host invites or the timing a host hold a bamboo tea scoop to put the powdered green tea into a tea bowl. In addition, please remember to say “Osakini” which means “Excuse me for going before you” to the next guest and “Thank you for the tea” to the host. Please remember 3 greetings before drinking tea. 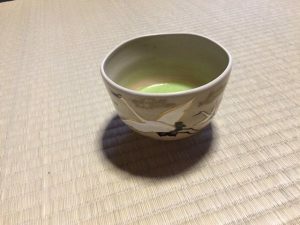 After you receive a tea bowl, put a tea bowl between you and the next guest, “Oasakini”. Putting a tea bowl between you and a guest before you, “I will join you”. At the last, put a tea bowl in front of you and “ Thank you for the tea” to the host. Hold a tea bowl and bow a little to show your respect, and turn twice clockwise to avoid drinking from the front face of the tea bowl. It’s not finished yet even you finish drinking, but this is the steps till you have tea. I can tell you the detail movements when you come to Tea Ceremony Koto. You don’t need to worry about the etiquette or tea utensils for the guests I wrote above. We will prepare everything you need for the tea ceremony experience in KOTO. My guest sometimes had thought why the price of Koto is ¥2700/45min while other tea houses are ¥2000/45min? 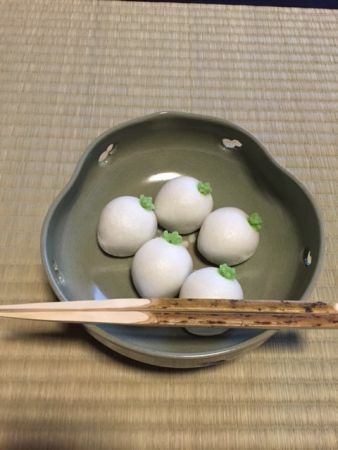 The quality of powdered green tea & sweets got higher (made by Ippodo tea shop) and you can experience real Japanese tea ceremony in that you can drink tea that a host makes and also tea you make by yourselves. 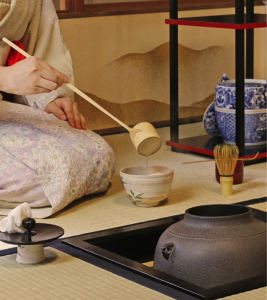 The main stream of Kyoto’s English tea ceremony is that a host will make tea as a demonstration and then customers will make tea by themselves. However, in the real tea ceremony, it is impossible for customers to make tea by themselves. Also, the taste of tea is changed by how you make tea. If you choose optional plan, you can have tea that a host makes and the one that you make as well. Additionally, you can experience the real tea ceremony.